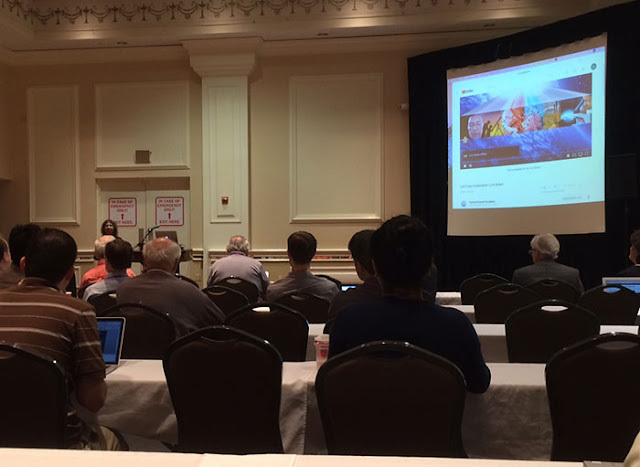 Well, here I am at the Gravitational Wave Astrophysics: Early Results from GW Searches and Electromagnetic Counterparts Symposium sponsored by IAU, hosted by LSU in Baton Rouge, LA. 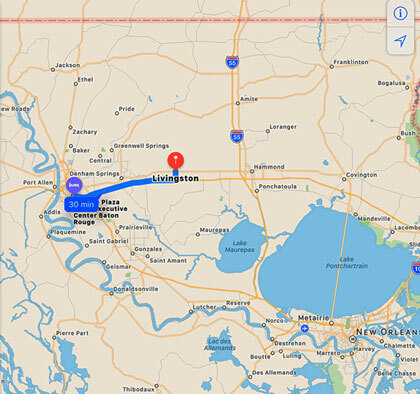 This location is conveniently about 80 miles from New Orleans and especially significant for this meeting is the LIGO (observatory) in Livingston, LA being only about 25 miles away. A key part of this symposium is the included tour of LIGO and finally the long anticipated announcement of the detection of the merger of a binary neutron star system. Check out the map of the area below. I met up here with OCA Science Nerds and Theatre Impresarios, Scott and Sandy, where we seemed to be the only attendees who were not in on the secret details of the announcement. The symposium agenda was rearranged slightly to include to live streamed news conferences from NSF in which the details of the first LIGO and Virgo Collaboration detection of the merger of two neutron stars with the additional detection of the first electromagnetic counterpart detection by various other optical, gamma ray and x-ray and radio telescopes. 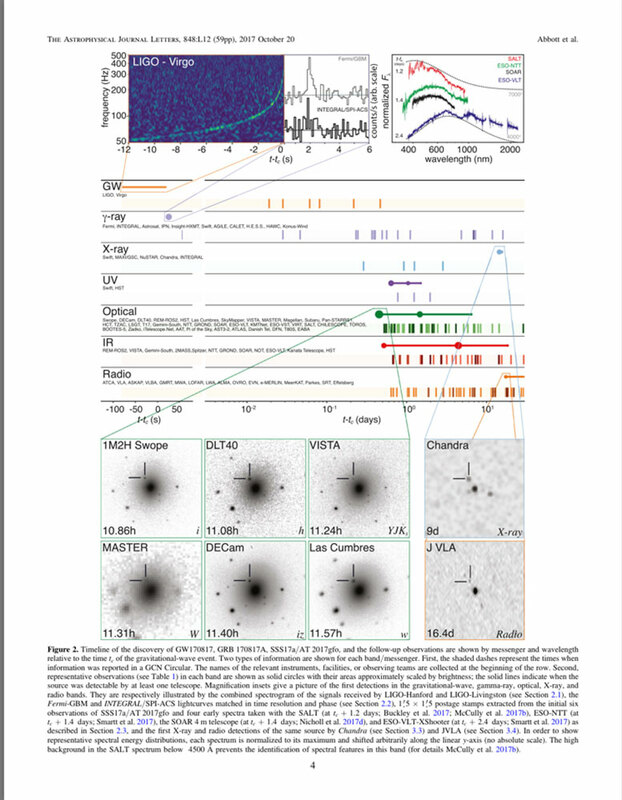 The detection is named GW170817 if you want to search for any published papers. The event was about 40 Mpc away and one of the neutron stars weighed about 1.36 - 2.26 solar masses and the other one was about 0.86 - 1.36 solar masses. The LIGO collaboration now includes the addition of the Virgo interferometer in Pisa, Italy, which is now the third system now online. Although the location of the merger was located very close to the blind spot for the Virgo detector, the fact that it was online at the time helped identify and shrink the potential location to something like 60 square degrees instead of 1160 square degrees, without Virgo. This collaboration includes over 1500 members, 120 different institutions, located in over 21 countries. I had promised several folks back in OC that I would blog a summary of the results so here goes. My summary will not include many of the details that have been released in a blizzard of papers appearing at various physics website and the archive, but a promise is a promise and rather than heading straight to the martini bar, I can forward this short summary, but all of you serious astrophysicist wannabe types can look up the actual papers. We all had expected that eventually the merger of a binary neutron star system would be detected, but the amazing additional part of the detection, originally detected by in August 17, 2017, just before the solar eclipse, and kept secret all this time, was the additional detection of the electromagnetic counterparts. Perhaps the best way to summarize the discovery is to use the following page copied from one of the paper presentations. This timeline shows the LIGO detection event followed about 1.7 seconds later by the detection of a gamma ray burst that is from the same location as the merger. Then after a delay of several days the detection of X-rays was reported. Later still the optical signal and radio signal were detected. This timeline shows the various observatories that participated in this first reported multimessenger detection. The different timeline appearances for the various messengers is apparently not all that surprising once you begin to look at how they are produced from the merger event. For me, the following cartoon, presented in Kunihito Ioka's poster presentation, is an ideal teaching introduction. The leading scenario is that the gamma rays are generated almost immediately during the merger but due to the high velocity jets produced and the special relativistic beaming effects, the arrival of the gamma rays shows up a bit later than the arrival of the gravitational waves. 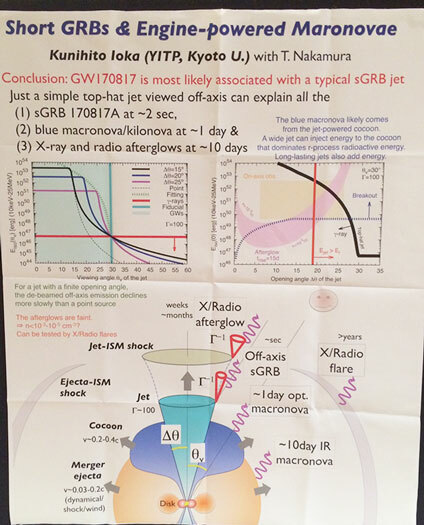 If you happen to be looking right down the barrel of the jets the arrival time could be zero and if you are looking a little bit to the side, the arrival time of the gamma rays can be delayed. Likewise for the other messengers. The arrival of the x-rays and other optical components depends on when the high energy of the merger has had time to move into the material surrounding the merger and excite that material to emit x-rays. The optical components were predicted to be seen about 1 day after the merger and the x-rays and radio were expected about 10 days after the merger. Luckily, the planned observation time allocated to Chandra extended out 10 days and even though people got discouraged when no x-rays were observed until finally, on the ninth day, they showed up from the location of the merger. This is the start of a new era in observational astronomy. Ever since the detection of gravity waves scientists anxiously waited for the detection of the other messengers, which can provide a further window into what processes are going on there. One thing that I learned today was that gravity waves provide information about the inclination of the orbital plane of the binary star system. In optical light curve measurements, one does not know the inclination angle between the orbit and the line of sight to the system. With gravity waves, since they consist of two separate polarizations, each at right angles to the line of propagation and observation, it is possible to work out what the inclination of the orbital plane of the source has to be. 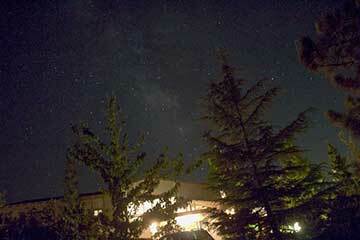 This is one example how gravity waves provide more information than is possible with just light waves alone. Another benefit of gravity waves is that their received amplitude is directly associated with the distance to the object and no need for special inverse square law modelling as with visible light. You will here this capability described in terms of the gravity waves being "standard sirens." So there you have a short summary of the detection event and progress made so far. We still look forward to 3 more days of exciting presentations. For other details check out the various papers that went online today. It is martini time after all!